Three locksmith companies in the 2009-10 Yellowbook for Tampa have listed addresses that correspond to other businesses in the USF area. There are no locksmith companies at these locations. Instead, they are the addresses for Jason's Deli off of Fowler Avenue, USF's Johnnie B. Byrd Sr. Alzheimer's Center and Research Institute, and the H. Lee Moffitt Cancer Center and Research Institute on campus. University Police (UP) spokeswoman Lt. Meg Ross said she's concerned that students may mistakenly call a locksmith and "receive poor service." The University ended its vehicle unlock program in April. 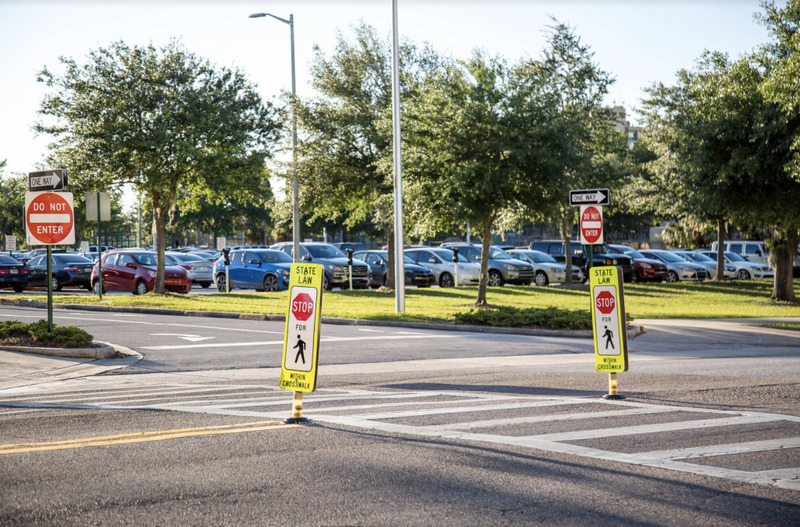 The program - a free service offered by AlliedBarton, Parking Enforcement and UP - assisted students, staff and faculty who were locked out of their cars. "It's important our students know that when they call a company (whose address) is listed here on campus, that they're not working with a campus organization," Ross said. So, why do the locksmiths' addresses correspond to those of other businesses? According to the 2009-10 Yellowbook for Tampa, the address for Always Available 24 Hour Emergency Locksmith is 2702 E. Fowler Ave. - the same as Jason's Deli. When reached via phone, Mike Allen, manager of Always Available 24 Hour Emergency Locksmith, said the company is a mobile service that works out of a van and does not have a storefront location. He said Yellowbook may have made a "mistake" by publishing the wrong address and they "have done so before." Information submitted to Yellowbook for publishing is not verified, said Jared Kreiner, spokesman for Yellow Book USA Inc.
Greg Sittig, a manager at Jason's Deli, said he was "unaware" the locksmith company was using the restaurant's address. Jason's Deli owner Blair LaCost said the use of his restaurant's address was "none of his concern" and it does not affect his business. Another misleading address is that of Available Emergency Locksmith. Its Yellowbook listing is 4001 E. Fletcher Ave., which is the address for the Johnnie B. Byrd Sr. Alzheimer's Center and Research Institute on campus. An operator for Available Emergency Locksmith said the company is a mobile locksmith and does not have a storefront location. The H. Lee Moffitt Cancer Center & Research Institute on campus also shares its address with a locksmith company. Located at 12902 Magnolia Dr. is Magnolia's Anywhere A Locksmith Service. Representatives for Magnolia's Anywhere A Locksmith Service declined to comment. After searching the City of Tampa Web site, Ross said she could not locate the locksmith companies' business licenses by address or business name in the Certified Business Directory tax receipt records. "It does seem they're operating out of the normal business behavior," Ross said. "I would say if it's a campus address, they don't have the authority to use it." But Associate General Counsel for USF Henry Lavandera said simply using a University's address may not be enough to press criminal charges. "By someone using our name, they're essentially using our goodwill endorsement," he said. Lavandera said he's looking into whether the companies' use of a USF address is a legal issue. "Arguably, it's fraud because at that point you're leading people to believe you're located in the community," he said. The University may send a "cease and desist" letter demanding the companies refrain from using a campus address, Lavandera said. Investigating the companies is up to law enforcement, he said. Always Available 24 Hour Emergency Locksmith has serviced the Tampa area for two years with two technicians, Allen said. The company is certified through the state and accredited by the Better Business Bureau of West Florida Inc. (BBB), he said. But the three locksmith companies listed in the area are not registered with the BBB, according to a BBB document listing registered locksmiths in West Tampa. The BBB accredits verifiable and "trustworthy" companies after an investigation and an agreement to meet and maintain certain standards, said BBB manager John Zajac. John Devito, owner of a BBB-accredited locksmith, Door-Lock Solutions LLC., based in Land O' Lakes, said he has worked as a locksmith for 33 years and is aware of locksmith scams in the area. "I know who they are, but I'm not going to get into who's doing it," he said. Mobile locksmiths claim to have a physical address when they do not, which has been "going on for years," Devito said. "The hardest thing that we have here in Florida is that you've got companies advertising in Florida, but are based out of New Jersey," he said. "It's legal, but they tell people that they are here in Tampa and they're not." Mobile locksmiths tend to say all they charge is $45, but after the service is provided they "change the prices, scamming the customers," Devito said. Always Available 24 Hour Emergency Locksmith's flat fee is $65 to unlock a car door and could increase depending on the "difficulty" of unlocking it, Allen said. Retired locksmith Richard Formica said companies use "car-opening tools" that are available for purchase at local stores. "What we think is the problem is some scam organization is hiring these freelancers who apparently appear to have very little knowledge except some very basic drilling skills or prying skills," he said. Formica, former owner of Power Lock and Key in Tampa, and other members of the Associated Locksmiths of America (ALOA) tried to report "scamming" locksmiths to the state attorney general by asking customers for copies of the service receipts, but they couldn't obtain any. Formica said calls to a locksmith might go to a "call center" instead of the actual business. A receptionist answers and contacts a locksmith who then sets up the appointment with the customer, he said. The locksmiths service homes and cars, sometimes even breaking locks on purpose, Formica said. "When a skilled safe technician drills a face to get it open … (he) drills it to where there's minimum damage, but when these (freelancers) drill locks, they destroy them so they can replace them." Formica said locksmiths then replace the lock and charge "horrendous fees" for drilling, removing the old lock and installing a new one, which could be purchased at a store for much less. Sometimes, Formica said, the locksmiths demand cash payments and even offer customers a ride to the nearest ATM machine. The Oracle attempted to reach Allen again Tuesday. However, after dialing the same number of Always Available 24 Hour Emergency Locksmith, two operators said no one by the name of Mike Allen worked there. According to the official ALOA Web site, there is no law in Florida that requires locksmiths to have a license. ALOA offers tips for individuals looking to hire a locksmith, such as asking for identification, a business card and an itemized invoice. According to the Web site, scamming locksmiths usually answer the phone with a generic phrase "locksmith service," so ask the operator, "What is the legal name of your business?" To file a complaint about a locksmith, visit ftc.gov or call toll-free, 1-877-FTC-HELP (1-877-382-4357) or TTY: 1-866-653-4261. For a listing of BBB-accredited locksmiths and ratings for unaccredited ones, visit bbb.org.